it is only the first week of October and the temperatures have dropped. that 20 degree difference means i don’t really want to eat raw, cold veggies and it is time to start making soups! one of my favorites it a roasted carrot and ginger soup – and the original also had butternut squash, too which i am usually too lazy to chop as that skin is soooo hard. my hand actually aches after i try to cut it up. so i either buy it chopped, or just use carrots. i sometimes will add sweet potato or rutabaga, too! so there are many things you can do, but absolutely do NOT skimp on the ginger! – in a large pot, heat up the oil on med-high heat. saute onions and keep adding chopped carrots as you chop them. saute until caramelized. do not stir constantly, but let the carrots and onions pan roast and brown about 2-3 minutes before stirring again. add chopped ginger and continue this for about 15 minutes. this pan roasting will give you some awesome flavor! – add the water and broth. simmer on med low for about 15 minutes. 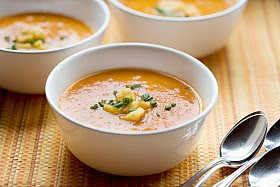 – if you have n immersion blender, use this to puree the carrots into a creamy texture. if you want it creamy, you can add some coconut milk (canned). if you do not have an immersion blender, you can put into a blender, but wait til it cools off – the lid will explode off the machine if you have too much hot liquid in the blender. trust me on this – either hold the top on and let cool before you put it in, or use a lot less! add more fresh chopped ginger and maybe a dollop of goat yogurt when serving. add some walnuts on top and enjoy! now to make mine for today! for more information on good for you recipes and nutrition information, check out www.n-im.net or find Nutrition in Motion on Facebook!